My almost 3-year-old son has come out of his shell lately. Usually shy and withdrawn around most people, Connor has all the sudden become the little life of the party in an unusual way: he loves to pretend to be different animals. Most often, a dragon. I'm not quite sure where he got the idea, but it's pretty darn cute seeing him flap his little arms while pretending to fly around the house and breathe fire like a dragon! 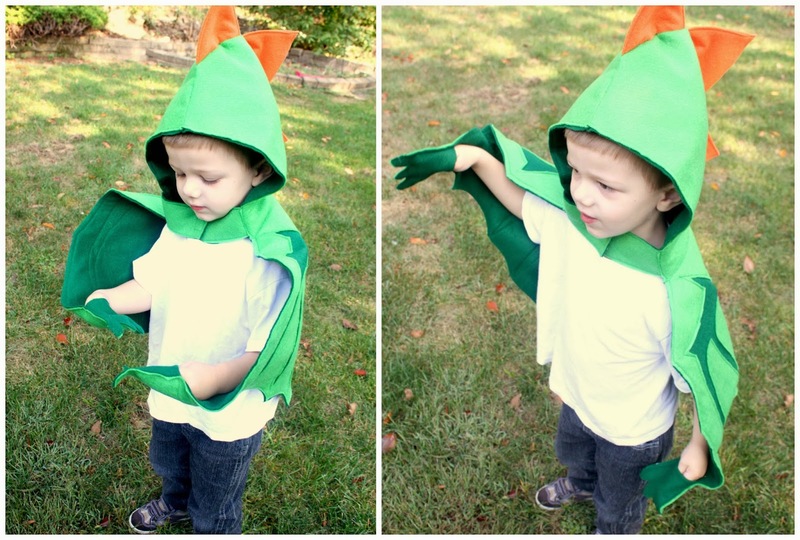 When trying to decide what costume Connor should wear this Halloween, it took me about 2 seconds to decide that Connor needed a dragon costume. There's one obstacle though: Connor doesn't like wearing costumes. At all. Maybe it's the feeling of wearing multiple layers of clothing, but whatever the case, I knew I had to get creative. 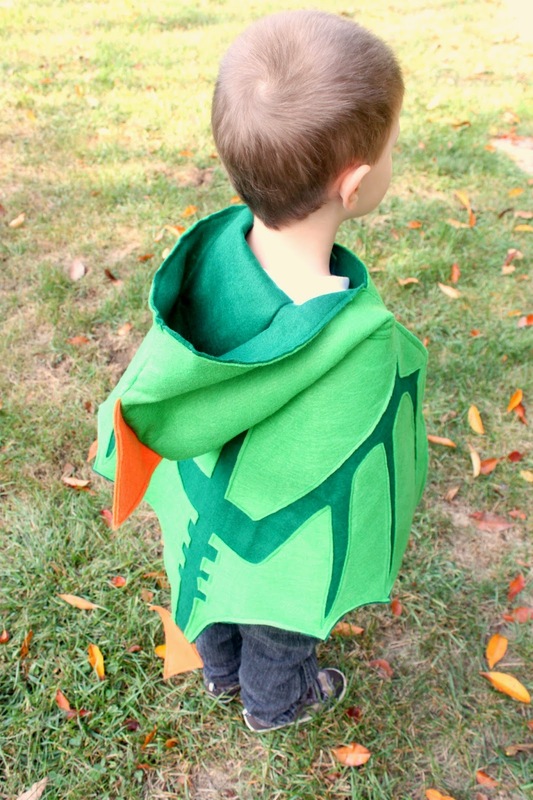 I thought about my options for awhile, and finally landed on the idea of making Connor a hooded dragon cape out of felt. 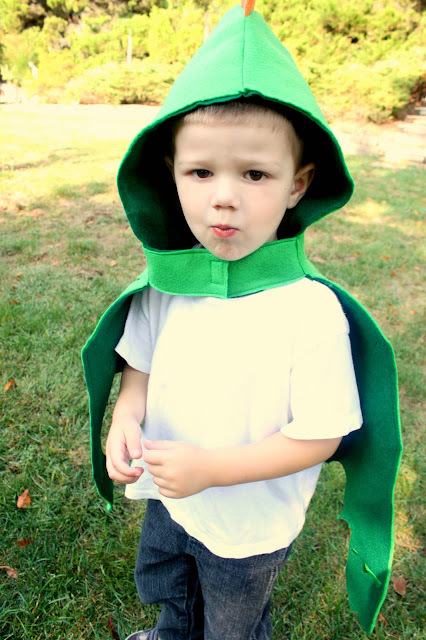 This felt dragon cape is lightweight, and since I made a cape rather than a full costume it doesn't bother him at all. 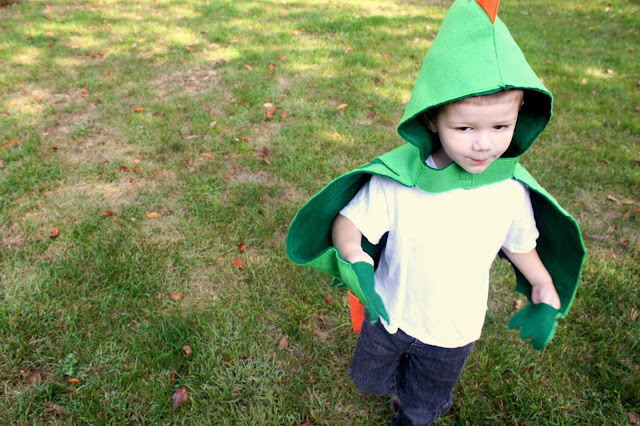 Plus, it has a hood in case the weather is chilly, and velcro tabs at the neck keep the dragon wings on on in case he wants to put the hood down. But the best part? 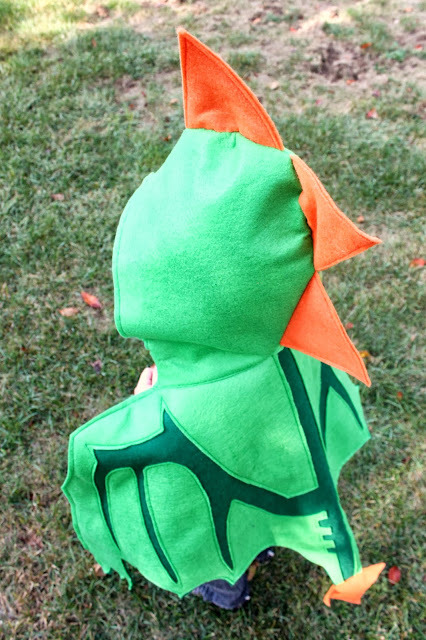 The cape has slits in the lining so my little dragon can flap his wings. Because what fun is it being a dragon if you can't fly around breathing fire?? SUPPLIES: 1 yard each of 2 different colors of green felt (I used Rainbow Recycled Classic Felt in Apple Green and Kelly Green from Michael Levine, Inc.), scraps of felt to use for spikes and tail (I used Rainbow Recycled Classic Felt in Orange from Michael Levine, Inc.), shirt with a hood to use as a template, freezer paper or wrapping paper to make the pattern, chalk or disappearing ink marker, rotary cutter and mat, small piece of velcro, sewing machine and basic sewing supplies. ONE: fold your template shirt in half and lay it on the edge of your paper. TWO: trace around the neck, top of the arm, and bottom of the shirt only, adding 1/2 inch for seam allowance. THREE: where the sleeve ends, draw a dragon hand. Make sure the hand is a little bigger than your child's hand since we will be making a slit in the costume for him/her to fit their hand into later. 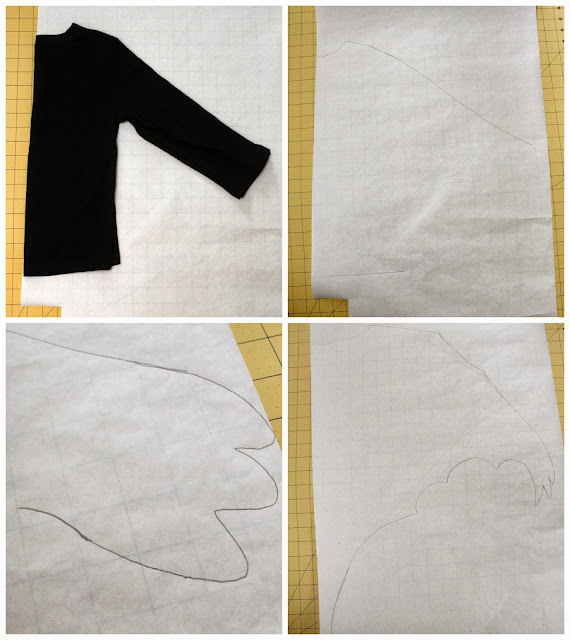 FOUR: draw the rest of the dragon wing shape, ending just below the bottom of the shirt line that you drew. I also altered the sleeve to make it more pointed and "dragon-like." 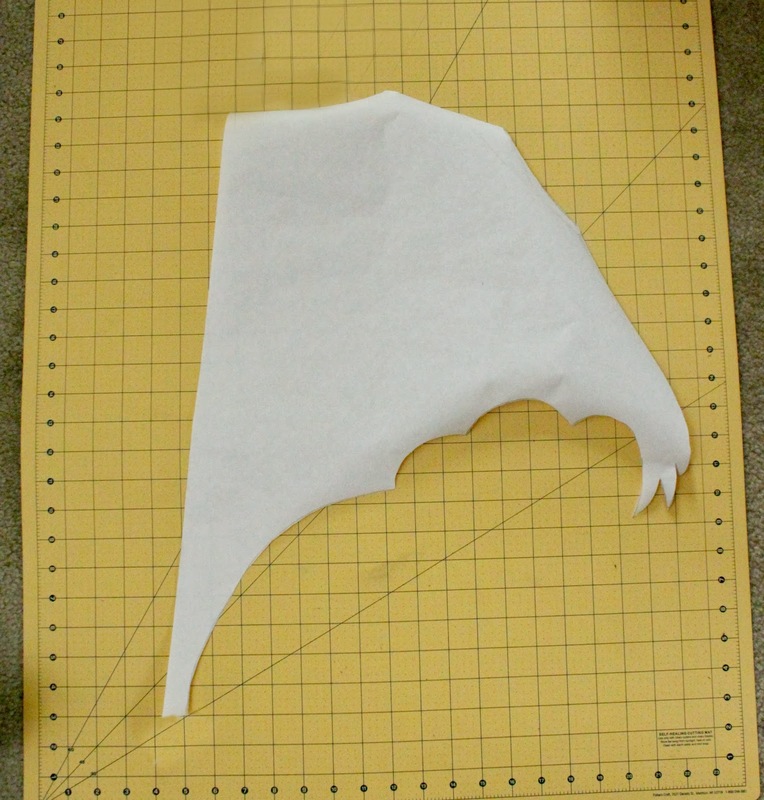 FIVE: cut out your pattern piece. SIX: fold one of your sheets of green felt in half and lay your pattern on the fold. 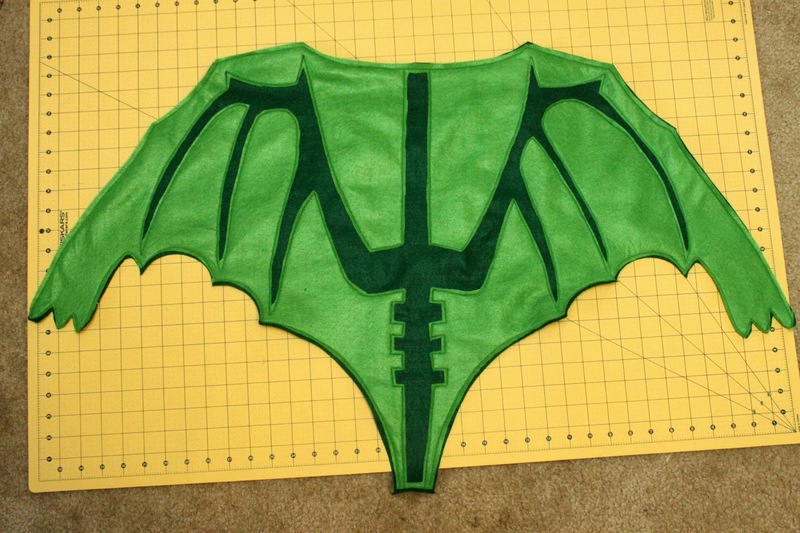 Trace around your pattern and cut out your dragon wings. Repeat with your other shade of green felt. You should have 2 felt dragon wings. 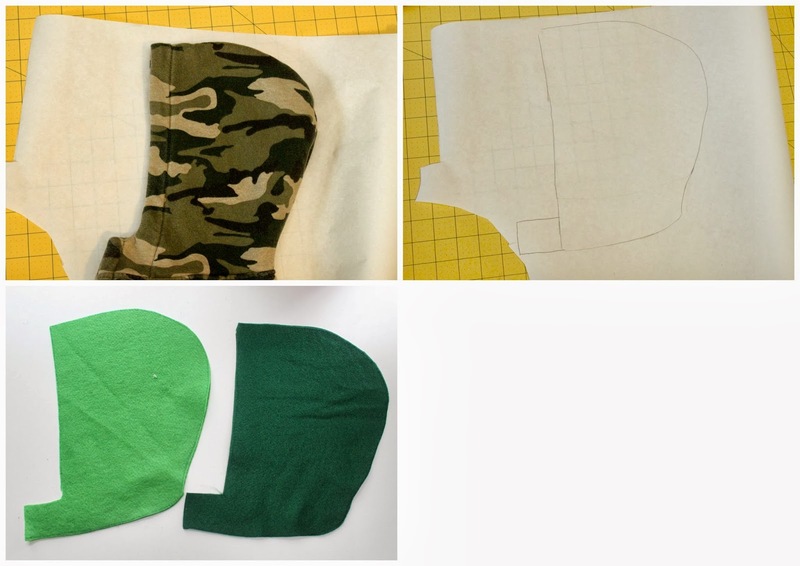 SEVEN: lay your template shirt on a piece of pattern and trace around the hood, adding 1/2 inch for seam allowance. EIGHT: add a 4 inch long by 2 inch wide rectangle tab to the front of the hood (see picture above.) This will be used to secure the hood around your child's neck with velcro later. We are going to utilize reverse applique to make the dragon wing design. If you've never done reverse applique before, you'll love it! It's a great way to easily sew intricate patterns by layering fabric and cutting away the top layer of fabric to reveal the one underneath. ONE: place your 2 dragon wings together and match up the raw edges. Pin all around and sew edges closed. TWO: Use your chalk or disappearing ink marker to draw your dragon wing design. If you have no idea what design to draw, a quick Google of "dragon wings" should give you some good ideas! THREE: sew on top of the design that you drew. FOUR: if you have small scissors, that would be ideal for this next step. If not, no worries, I used regular scissors. 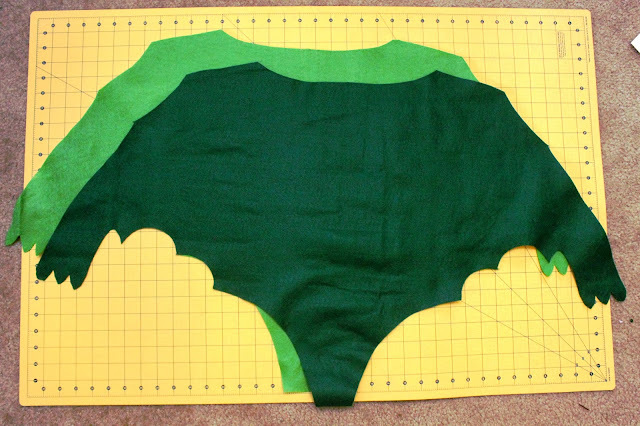 Begin to cut away the top layer only inside of the design you just stitched. try to cut as close to the stitching as possible without cutting through the stitches. After you've cut away the top layer, it will reveal your felt below the design making it pop! 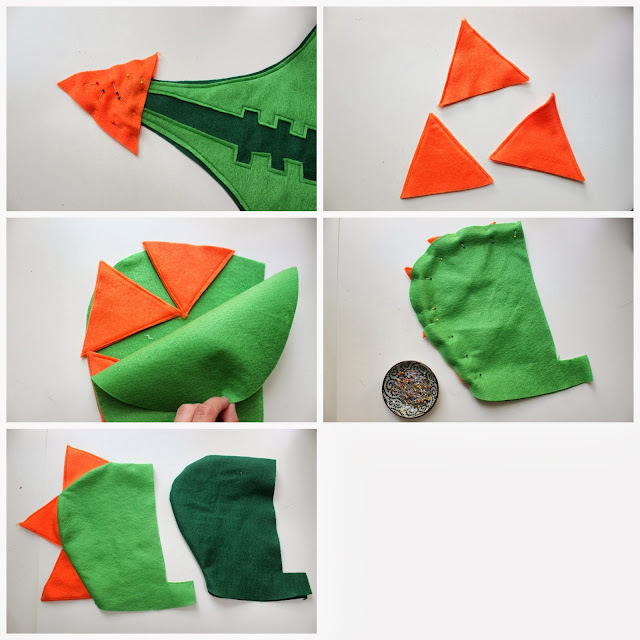 ONE: cut several pairs of triangles from your scrap felt to add to the tail and hood (I cut a total of 8 triangles.) Sandwich the end of your dragon tail between two triangles and sew around the edges to attach. TWO: for the remaining triangles, sew 2 of the 3 sides. FIVE: turn your hood inside out revealing your triangles. For your other 2 hood pieces, simply pin and sew the curved portion from top to bottom as you did above. SIX: insert your inner hood inside of you main hood and match up the raw edges. 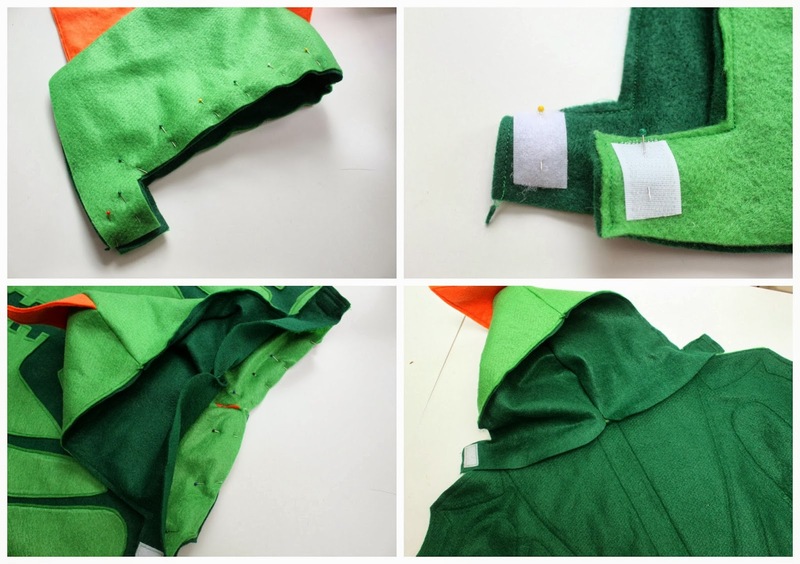 Pin around the outer edges and tabs as shown above and sew to attach the 2 hoods, leaving the bottom unsewn. 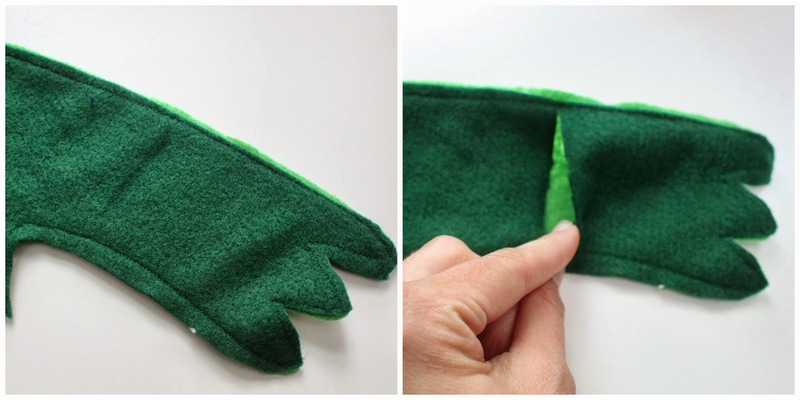 SEVEN: cut two pieces of velcro and sew the hook portion (the scratchy part) to the inside tab on your hood. Sew the loop portion (the soft part) to the outside of your other tab. NINE: flip your hood down so that your inner hood hides the raw edges of the neckline you just sewed. Use your fingers to fold under the raw edges of your inner hood, and sew your inner hood along the neckline. For the final step, you'll want to make slits in the inner layer of felt for your child to slip his/her hand into so they're able to flap the wings! 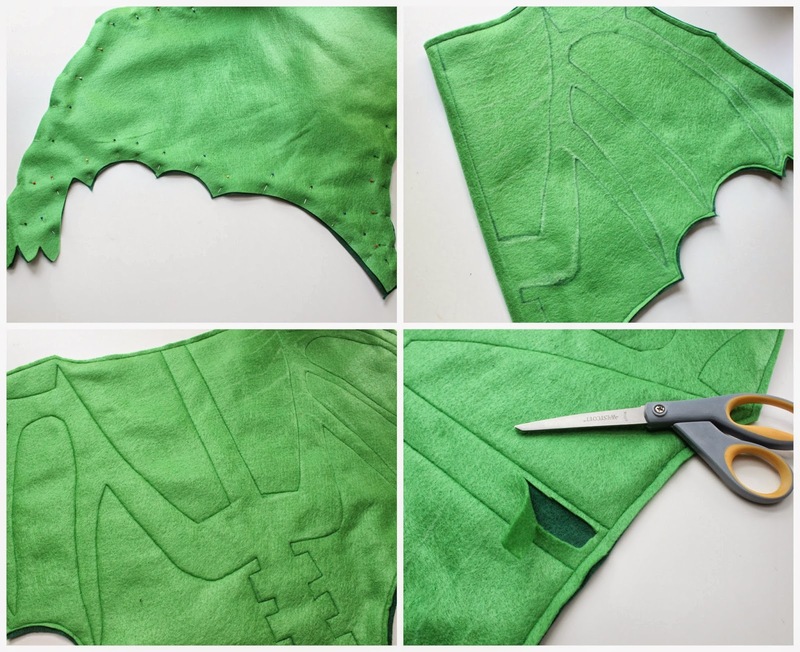 Simply mark a line in the inner layer of felt and use scissors to cut a line in the inner layer only. Now admire your ferocious dragon cape! Now, of course, is the true test. Trying it on your little dragon to see if he approves. 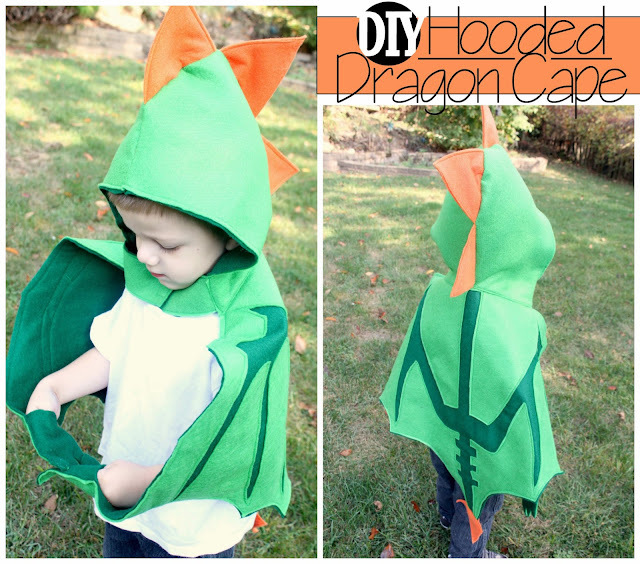 And if your little dragon doesn't feel like wearing the hood, no problem. 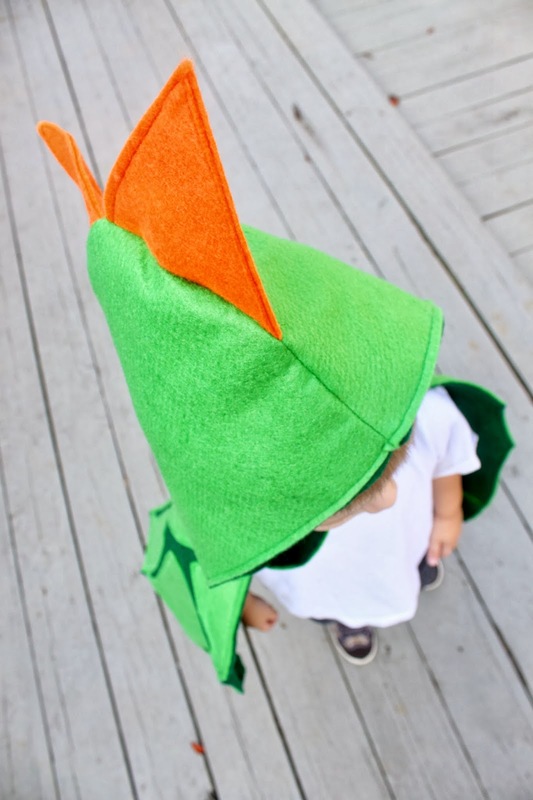 The velcro tab at the neck will make sure his wings don't fall off while he's trick-or-treating or doing other dragon-y things. 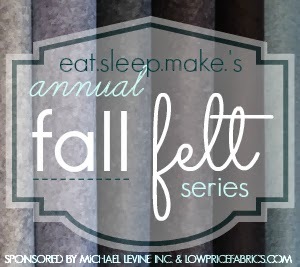 See you back here tomorrow for another felt project during our Fall Felt Series! My four year old would love this, too! Great tutorial. I like the idea of using your kids clothes to measure it out for a perfect fit. one word - awesome!!! I will be making at least one of these! I am in love with this dragon cape!!! Great details. Seriously LOVE. This is so cute!!! I'm featuring this on MMM this weekend. Such a good idea! I kinda want to make for Wub. Love it.